STC member company KW Special Projects and its Managing Director Kieron Salter have been named Business and Businessman of the Year respectively at the 2018 Northamptonshire Business Awards. The accolades cap off an extraordinary year for high performance engineering consultancy KWSP in which it has designed, manufactured and installed the UK’s first cycling-specific wind tunnel at the Boardman Performance Centre in Evesham and been named a key engineering partner to the new Uniti One electric vehicle project. Key to the company being named Northamptonshire Business of the Year is the company’s sector-agnostic horizontal innovation approach to projects, transferring knowledge and technology from one sector to another. This ethos has seen KWSP successfully develop the b.my.jet digital braille printer in partnership with Alchemie technology and the Central European Research Centre, and its ToPCaT thermoplastic carbon chassis solution, which provides lightweight structures to the growing new energy vehicle (NEV) market. 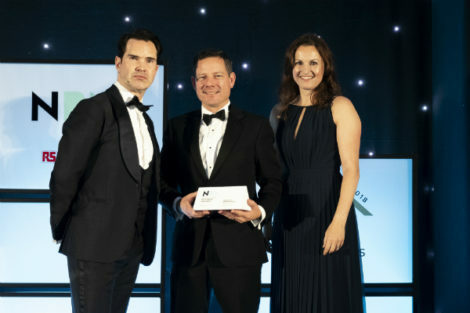 The Northants awards – hosted by TV comedian Jimmy Carr – also recognised KWSP’s MD Kieron Salter who has been instrumental in growing the business’s revenues by 37% year-on-year. Throughout the past six years, he has grown the business from a single-person motorsport consultancy to a multi-million-pound business, delivering projects to clients across automotive, performance sports and manufacturing. Kieron, also an STC Board member, commented: “Our success at this year’s Northamptonshire Business Awards is testament to the hard work and dedication of the entire KWSP team. “It’s been a very busy year for the business in which we’ve been involved with some incredibly exciting projects, so it’s fantastic to receive recognition at such an esteemed award ceremony. Recognising examples of innovation and industry-best practice from across the county, this year’s Northamptonshire Business Awards ceremony took place on 15 November, at Northampton’s County Ground. CLICK HERE to learn more about KWSP’s services.